It is a damp day here in the Kingston area and I have a number of errands so I drove into the city to do them and to write a post. 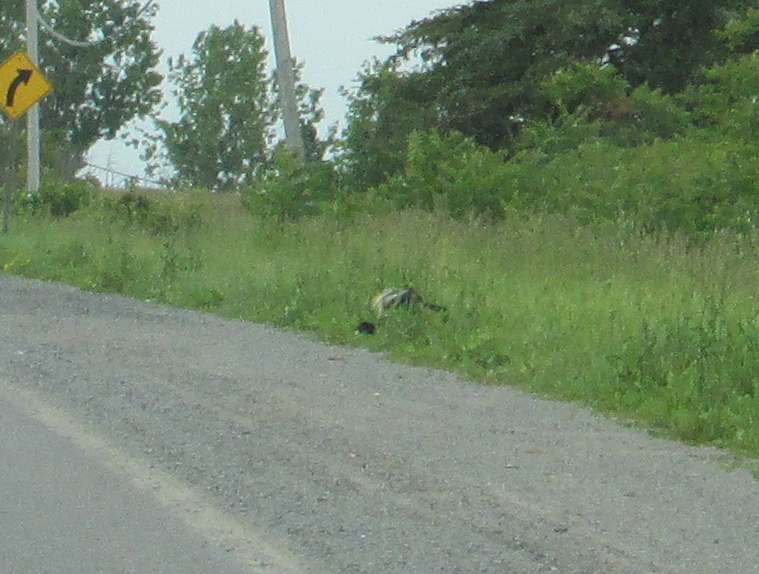 On the way in on the road was a mama skunk and her two babies. I stopped a long way back and tried to find my camera. The babies were dawdling and mama had to stop and turn around and push them along. It was so beautiful to see her caring for her sweet tiny babies. By the time I found my camera I caught one baby partially covered by grass and the tip of mama’s tail. Still, I wanted to share the experience. The babies are ever so cute and they have a wonderful, loving mama. That’s something i would do. I love skunks, minus the smell. One lives in our apartment building as a pet, what a sweet she is. I heard they make really great pets. I have never seen a domestic one. I imagine I would love them. I can’t help myself. It is such a great time of the year to see mothers and babies of every sort. Even Human ones in Darkness and no sleep is not soo good! I look forward to your heartwarming, experiential blog posts. I am living vicariously through you. Thank you!!! !